At an event that drew a cohort of over 600 coding enthusiasts, nearly 100 teams built apps and gadgets that talked, mimicked, planned, donated and edited videos. One coached public speaking. Another sorted trash. 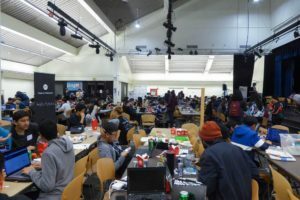 CruzHacks, UC Santa Cruz’s annual coding binge, took over Stevenson Event Center from Jan. 18-20. The 36-hour hackathon brought students from across the U.S. and Canada, NorCal tech leaders and local volunteers under one roof. 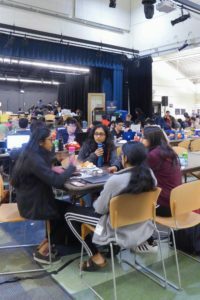 The goal of the event was less about breaking into private email servers and more about testing out neat ideas, said Amit Saxena, fourth-year and co-president of the CruzHacks organizational committee. In small teams, hackers created apps, gadgets and other devices that integrated popular tech products like Amazon Alexa or achieved technical feats. Seven of the 13 hackathon events were sponsored by tech firms including Amazon Web Services, Google, Inc. and Microsoft. Companies awarded prizes to teams that best built these existing services into their projects. The remaining events, like the TechCares and Tech Innovation prizes, were determined by more-holistic criteria. Google engineering manager Peter Bergstrom said he favored projects that had a wide social reach. The hackathon was organized in partnership with Major League Hacking (MLH) a New York-based company that seeds coding events across the globe. It acted as the middleman between CruzHacks and its big tech sponsors and provided attendees with prizes, rentable hardware and enough cans of Red Bull to flood Silicon Valley. Like a 1,000-mile game of telephone, O’Rourke’s team joined an Arduino Uno microcontroller to a rented Qualcomm Dragonboard, attached a gyroscope, accelerometer and GPS antenna to the setup. They then connected it all to Google-based web service called Firebase, then another server on Google Cloud Platform and finally to an Android app. CruzHacks was not exclusive to tech-heads. The event was host to a number of introductory workshops, with courses in Python, web development and machine-learning led by industry experts throughout Friday and Saturday. A small army of volunteer mentors also made midnight rounds. LockWire team member Kenny Collings recalled that Frank Piva, a software engineer from the Santa Cruz app developer productOps, stopped by their team’s table at around 3 a.m. on Saturday. It was a long two nights. Participants encountered issues ranging from spotty Wi-Fi connectivity to smoking breadboards. One team saw its server access pirated by hackers — real ones — traced to South Asia. “They’re mining crypto!” team member Ryan Sparno said, in reference to the power-heavy process in which bitcoins are minted. Just outside of the event center, the Silverman Conference Room was converted into a nap station and saw steady traffic throughout the wee hours of the morning. In true coder fashion, competitors whipped their projects into shape over the final night of the event. LockWire, bogged down in the particulars of database networking all through Saturday, managed to finish a working prototype before the Sunday 10 a.m. freeze deadline. “At 6 a.m. we told ourselves, ‘That’s it! No more!’” O’Rourke said Sunday afternoon. Teams arrayed their projects at numbered slots on the long plastic tables that had covered the event center for the past three days. Judges snaked through the bazaar of presentations throughout the early afternoon. The awards ceremony began at 3 p.m. and ended one hour later — it was the conclusion to a weekend of highs, lows, wins, losses and too much caffeine. In response to the nation’s growing Alzheimer’s epidemic, the Iris team wanted to provide patients suffering from memory-loss with a tool to manage their relationships. Reminiscent of Joaquin Phoenix’s digital companion in the 2013 film Her, Iris runs in the background on a shirt-pocketed smartphone. When presented with a face stored in its memory—like one of a family member—it relays facts about that person to the user. Iris won the top Google Cloud Platform prize for the best use of the service and second-place in the TechCares category. To combat the misconception that programmers can’t speak above five decibels, the team behind stage_fright created an interactive speech coach that tells its user to stand up straight, project and cut out the ‘um’s.’ Written to use Oculus Rift VR goggles, the app sets a stage in cyberspace with a packed auditorium of faces staring expectantly at the user. stage_fright won the top TechCares prize and was the runner-up for UCSC’s own Arts Division award. Tired of the small, unhelpful graphics that have smattered STEM textbooks for decades, the chemisTRY team wrested ‘90s-era teaching supplements into 2019. Within an augmented reality environment — similar to the one Snapchat generates to put dog-faces on selfies — the app renders real-time simulations of cell structures, water molecules and other natural phenomena to provide classrooms with an effective and engaging educational aid.